Free cancelations are possible up to 3 weeks in adance. After that time you have to pay the whole price. Home away from Home @ Townside! 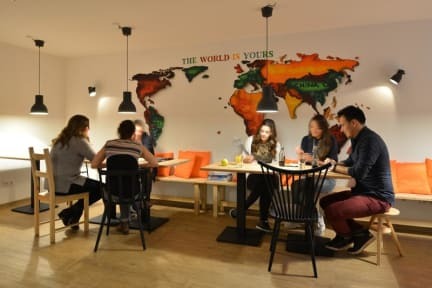 We're located in the centre of Bremens liveliest student quarter and only a stone throw from the city centre. Next to numerous bars and cafes you'll find many supermarkets and shopping possibilities in the immediate neighborhood. And with Bremen's public transport system it will take you a maximum of 30 minutes to get to all the hot spots, museums and event venues. Although there was no atmosphere this was a really nice hostel, it was clean, quiet, the bed and lockers both had plug sockets and was able to choose which bed to sleep in. The staff member was really friendly and the showers were really modern. You do have to put your own sheets on and take them down in the morning which can be noisy. The female dorm was quite small for 5 people - 1 bunk and 1 single bed on the floor, and 2 singles on a mezzanine style second floor. Unfortunately we couldn’t stand up on the mezzanine, as it was only a half level. Toilet/shower facilities were clean and adequate. WiFi was pretty dodgy the entire time we were there (even in common areas), even though the hostel didn’t appear to be at full capacity. Staff is cooperative and very friendly, in my seven bed dorm there was only one guy from Greece, WiFi was working perfectly, location is best as it is near from all the facilities/ tram station. Really nice with a superb wall map Hosters are also friendly, especially the blonde girl originally from Hannover, totally adapted to the city roghr now! Best beds ever. Big concrete bunks that make no noise, don’t move and muffle all the sounds. Loved that. The common area is just ok, has no bar. Great location between the city center and the stadium. Quite room, had great nights sleep, sturdy wooden bed frame for comfy bed, fluffy pillow. Room floor was not clean however, underneath bunks were trash, debris that collected over times. I did asked housekeeper to sweep and mop it, and then it was nice.